Uckfield completed their first ever league and cup double on Saturday with a clinical 20-8 victory over Burgess Hill at Hempstead Fields. 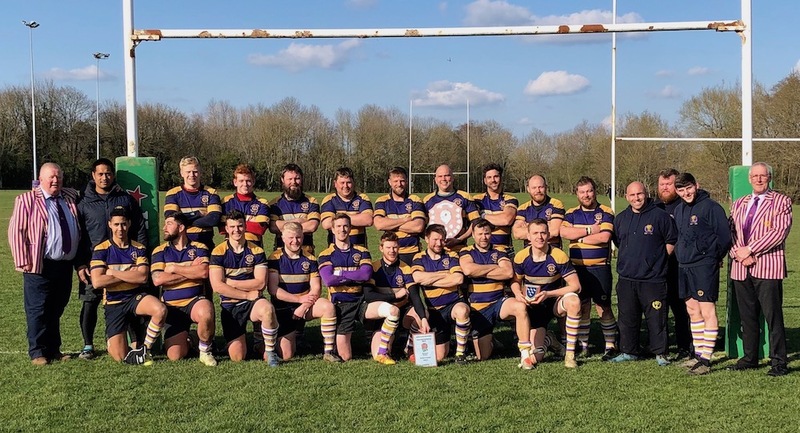 The curtain raiser to the Harvey’s Sussex Shield Final, was a clash between Seaford and Haywards Heath Rams who were competing in the Harvey’s Sussex Plate Final, the Rams being victorious, writes Gordon Buckland. Then the huge crowd were treated to some entertaining Under 8s touch rugby between Uckfield and Burgess Hill and a walking rugby demonstration by Seaford showing how the youngest and elders in our community can enjoy this great sport. Uckfield were able to name a largely unchanged side to the one that finished the league campaign three weeks previously. Due to the rules of the Cup Competition an extended bench is allowed, meaning that most of the Uckfield squad were able to get game time for the last time this season. Spring was in the air with the sun shining, a large crowd and a party atmosphere. The game started with Uckfield dominating territory, constantly forcing The Sussex All Blacks back into their own half. For 15 minutes Uckfield were unable to cross the Hill line, but the deadlock was broken when a pre-planned line out move saw Harry Harper-Dowe burst through before off-loading to Matthew Evans, a quick ruck and one pass led to Davy Armstrong crashing over. Burgess Hill had a spell of territory from the restart and put pressure on Uckfield. They scored a very well worked try, the conversion was missed 5-5, Hill continued to pressure Uckfield and when Captain Hartfield was sin-binned for going off his feet at the breakdown the pressure was on Uckfield. Another penalty to Hill was slotted, score 5-8 with only four minutes to half time. Most thought the half would fizzle out, but the next four minutes saw Uckfield gain a penalty opportunity of their own, allowing Fly-Half Charlie Buckland to step up and level the scores. As the half was coming to an end a seemingly harmless scuffle resulted in both M Evans and a Burgess Hill player being sin-binned. 8-8 at half time. At 50 minutes both teams were restored to their full complement and the game was very much back on, a physical and determined Uckfield through a solid line out good catch and drive were this time able to release the back line. Outstanding handling led to veteran full back Lee Evans scoring. His finish was exceptional as he twisted over the line in the corner. 20-8. Uckfield controlled large portions of the last 20 minutes of the game and were unlucky not to score more points. Burgess Hill battled hard throughout the game and were certainly much improved from the last league fixture. The final whistle blew, and it was left to Sussex RFU, through John Feakins vice president, Gary Henderson chairman, Ken Nichols and Frank Edmonds to hand out the honours. All the players, coaching staff and all those involved at Uckfield Rugby club would like to thank everyone for making the day such a fantastic occasion and providing a fitting moment to end a hugely successful season. The senior squad will rest up for a couple of weeks before focusing on getting ready for the challenge of London South East 3 next season.